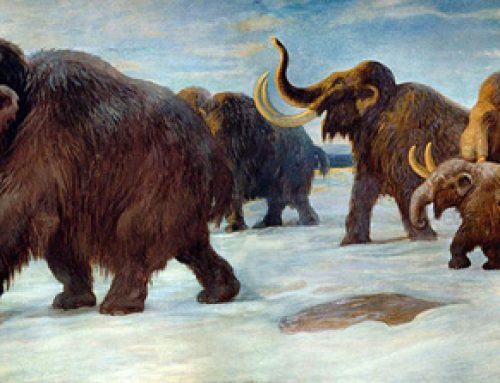 The Woolly Rhino, with its long shaggy coat and huge horn, or indeed two horns, is often depicted alongside Woolly Mammoths in Ice Age tableau. Certainly, there were a number of species that roamed the northern hemisphere during the Pleistocene Epoch, but scientists have remained uncertain as to where such beasts originated. Palaeontologists had speculated that Asia was most likely their original home and now the discovery of a 3.6 million year old Rhinoceros fossil suggests that Tibet may have been where these huge, prehistoric mammals originated from. Indeed, the geographic diversity of Woolly Rhinos is most puzzling. For example, fossils of Woolly Rhinos have been found all over Europe, even its most southern parts, but never in Ireland and surprisingly the fossil record suggest that these Ice Age creatures never migrated into North America. The Woolly Rhino (Coelodonta antiquitatis) was named and described by the German naturalist and anthropologist Johann Friedrich Blumenbach in 1807. Some species had just one large horn, whilst C. antiquitatis had two horns on its snout, the front horn being larger than the second horn located between the eyes. Woolly Rhinos were stocky, covered in long, shaggy hair with short legs, small ears and a dumpy tail – all adaptations for living in cold climates. But where do they originate from? Perhaps this Tibetan discovery can provide the answer. Ice Age megafauna have long been known to be associated with global cooling during the Pleistocene Epoch, and their adaptations to cold environments, such as large body size, long hair, and snow-sweeping structures, (horns and tusks for example), are best exemplified by the Woolly Mammoths and Woolly Rhinos. These traits were assumed to have evolved as a response to the ice sheet expansion. However, the research team have uncovered a large number of Pliocene Epoch aged mammal fossils from a high-altitude basin in the western Himalayas. Their discovery includes the remains of a primitive Woolly Rhino. These new Tibetan fossils suggest that some megaherbivores first evolved in Tibet before the beginning of the Ice Age. The cold winters in high Tibet served as a habituation ground for the megaherbivores, which became pre-adapted for the Ice Age, successfully expanding to the Eurasian mammoth steppe. Living in a cold and frosty environment led to these creatures being pre-adapted to the Ice Age when ice sheets expanded. The high Tibetan plateau may have been the evolutionary cradle for these prehistoric beasts. The fossil was found in Tibet’s Zanda Basin, an area that is still largely unexplored, rich in Pliocene fossils and along with this primitive Woolly Rhino the team unearthed examples of extinct horses, antelope, plus snow leopard, badger and numerous other types of mammal fossils. Dr. Wang, one of the research paper’s authors along with scientists from China, USA and Finland thinks that this new type of Rhinoceros merits a new species name: Coelodonta thibetana. The name means (old hollow tooth from Tibet). The researchers state that C. thibetana displays some very primitive features compared with its counterparts that lived through the later great glaciations of the Pleistocene Epoch. Judging from marks on the skull, the creature’s horn, which has not survived, would likely have been quite flat in construction and leaning forward. This might have allowed the animal more easily to sweep snow out of the way to get at vegetation, a useful behaviour for survival in the harsh Tibetan climate, the team says. A number of Woolly Rhinos had flattened, paddle like horns, suggesting their primary role was not defence but to help these beasts sweep away snow so that they could feed on the exposed vegetation. The scientists present their case for these beasts becoming pre-adapted to the Ice Age climate by evolving on the high Tibetan plateau in the scientific journal “Science”. “When this Rhino existed, the global climate was much warmer and the northern continents were free of the massive ice sheets seen in the later ice ages. Then, about a million years later, when the Ice Age did hit the world, these Tibetan Woolly Rhinos were basically pre-adapted to this harsh, cold environment because they had this ability to sweep snows. The origins of Woolly Rhinos? Although Dr. Wang admits much more field work is required to confirm the Tibetan plateau hypothesis, however, if the research team are correct these megaherbivores moved to lower latitudes as the world grew colder and they became geographically widespread across Eurasia, even to the United Kingdom. The condition of the fossil is exceptional, this is a big bonus for the palaeontologists, as numerous Rhino fossils are very incomplete and show signs of having been scavenged by the many large predators that roamed Europe and Asia during this time in prehistory.